In the kitchen, on the trail, or in the shop—be ready for all kinds of small injuries from cuts, to scrapes, scratches, rashes, and burns with colloidal silver. Even a small injury can transmit germs on the spot. Immediate care is important, no matter what caused the injury or how small. Immediate care makes ongoing care easier, and reduces the risk of complications like infection. 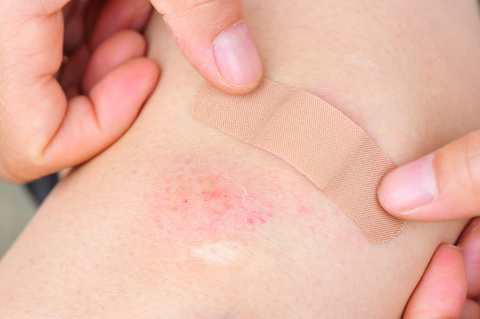 Even a the tiniest wound can become infected, and can often be inflamed. Wounds with a higher risk of infection—ones with dirt ground in, deeper wounds, or wounds caused by a dirty or rusty object—especially benefit from immediate care and ongoing close monitoring. The first step is to stabilize—get to safety or turn off equipment, then use cold water to stop a burn, a gauze to stop bleeding, running water to flush out chemicals, etc. You can also use something cold to help prevent bruising. Ignore internet chain mail, which in the past has given bad advice (keeping flour in the fridge does not make it a tool for stopping burns—flour will trap heat and make burns worse!). Next, clean the wound. If you have a strong fortitude, you can wash it yourself. If there’s dirt or other foreign material, it needs to be removed. If you can’t easily remove it yourself, head to urgent care. Most minor wounds should be easy to clean. Once the wound is clean, pat the area dry with a clean cloth. To aid healing, add skin support before a bandage. Colloidal silver has a long history of use helping skin to heal better and faster. Spray colloidal silver on the area, let dry for a minute, then keep the wound moist (Vaseline is one option, aloe or coconut oil are good for skin, too). Get colloidal silver and plant support for skin in one with Colloidal Silver Topical Cream. Use colloidal silver and a moisture barrier every time you change the bandage to support good healing from start to finish.